Buying real estate for your small business? It's an exciting move, but also a stressful one. Expanding to a new location or just renovating your current space is a big step for a small business owner--so you should know the ins and outs of the process before you get too far in over your head. By learning how to navigate commercial real estate loans, you'll be well equipped to get the best rate and terms for your business. This way, you can get the most out of your commercial real estate loan and save capital for your business. So, let's start with the basics: How do commercial real estate loans work? Use this guide to find out. Commercial real estate, as you might've guessed, is real estate that's used only for business purposes. So if you operate your small business through a retail store or office space, you're working out of commercial real estate. 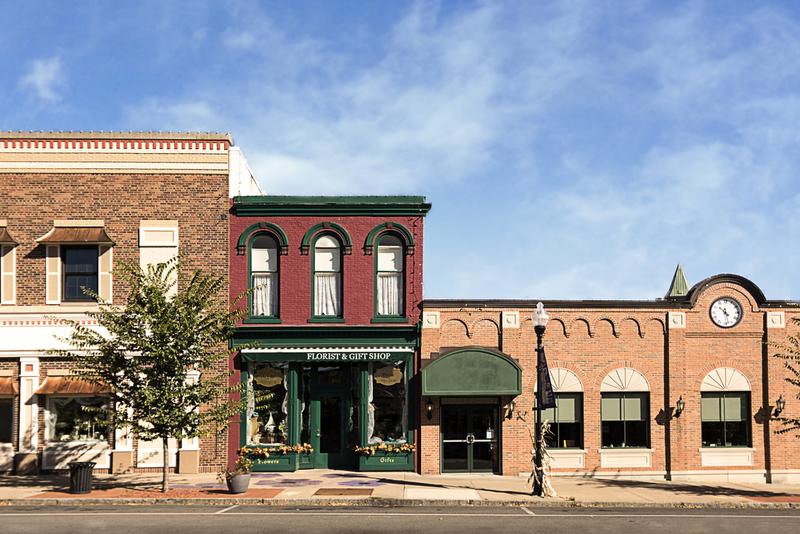 If you have plans to purchase new or existing commercial properties, you can take out a commercial real estate loan to help finance the purchase--and any development or construction after the fact. Commercial real estate loans are typically options for certain business entities, like a limited liability company or an s-corporation. All this is to say that businesses take out commercial real estate loans, not individuals. So, commercial real estate loans help you pay for the sky-high price tags that come attached to your new business property. Got it. Technically, commercial real estate loans are mortgage loans secured by liens on the commercial real estate you're purchasing--rather than on residential property. Let's take a step back. What's a lien? Well, in this specific case, a lien is a legal right that an owner of a property gives to a creditor, serving as a guarantee for the repayment of a commercial real estate loan. If the owner can't fulfill the debt repayment, that credit might be able to seize the asset secured by a lien. In the end, a lien just gives your commercial real estate lender some protection against the risk that you default on your loan and can't pay them back. When you take out a commercial real estate loan, you should absolutely expect to have a lien put on at least your business property. But you should also be prepared to make a down payment on your commercial real estate loan. Before funding your loan, major lenders will typically require a down payment between 20 - 30% of the property purchase price. Now for the nuts and bolts of commercial real estate loans: repayment terms, interest rates, and fees. Consider your average residential mortgage--like one you might have on your home. A typical residential mortgage is a type of amortized loan, where you repay the debt in regular installments over a fixed period of time, say 30 years. Unlike residential loans, commercial real estate loans come with two types of terms: intermediate-term loans of 3 years or less and long-term loans that last for 5 to 20 years. Also, a commercial real estate loan might come as an amortized loan--the one you know well--or as a balloon loan. An amortized loan gets repaid in fixed installments until you've fully paid the lender back, plus interest. A balloon loan, on the other hand, requires you to make one big payment at the end in order to pay off your remaining principal. Let's dig into how balloon commercial real estate loans work. When you take out a balloon commercial real estate loan, you're given a term typically ranging from 5 to 7 years. You'll have fixed monthly payments through that term, but those payments aren't set up to cover the entire loan repayment. Instead, the monthly payments are calculated as if the loan is a traditional 25- or 30-year mortgage--like a residential mortgage. At the end of your 5- to 7-year term, you'll have paid off only a portion of your principal balance, so the rest is due all at once. If you're considering a balloon commercial loan option, know this: that last payment could be very high. You should really only sign on the dotted line for a balloon loan if you know you'll have the cash on hand when it comes time to make the final payment. If you don't, you'll have to refinance your loan or sell your business property to make the balloon payment. As with any small business loan, the actual interest rate you get on your commercial real estate loan depends on your type of business, its financial health, and your creditworthiness. But in general, commercial real estate loans tend to come at a steeper interest rate than a residential mortgage would. Businesses are just riskier to lend to, especially if you're just starting up. Plus, most businesses have less established credit histories than individuals. You should also know that your interest rate will depend on the kind of real estate lender you work with. Life insurers, for instance, have rates ranging from 3.35 - 4.3%, while banks and credit unions offer rates at 3.35 - 6%. Check out the current averages for the various lender types to make sure you know all your rate options. Your interest rate will also depend on your loan-to-value (LTV) ratio. An LTV ratio measures the value of a loan against the value of the property purchased. Say you're purchasing a $100,000 piece of property. Commercial real estate lenders typically require borrowers to put a down payment of about 20 - 30% of the purchase price. So, you've covered a small portion of the cost and the lender is covering the rest of it by extending you the loan. In this case, the loan-to-value ratio is 70 - 80%. Here's where your interest rate comes in. If you have a high LTV, you'll likely have a higher interest rate. The lender has more skin in the game, so they have more to lose if you default on your commercial real estate loan. On the other hand, if you've paid more of the purchase price in the form of a down payment--and you have a lower LTV--you'll have a lower interest rate on your loan. You've taken on more of the equity in the property, meaning the lender takes on less risk. On top of interest rates, commercial real estate loans will come with fees. Most commercial real estate loans have upfront fees that you'll need to pay. Upfront fees are bundled into the overall cost of the loan--covering the property appraisal, legal costs, loan application, loan origination, and survey fees. Some commercial real estate lenders will want borrowers to pay upfront fees before the loan is approved. Others will just apply the fees annually. You should also be aware of fees associated with paying your commercial real estate loan off early. You might have a typical prepayment penalty, but there could also be an interest guarantee, a defeasance, or just a lockout barring you from paying early. All in all, a lender wants to preserve their anticipated gain on a loan, so they might charge you for paying early. Before you commit to your commercial real estate loan, always ask the lender to clearly explain any and all fees that will be a part of your total cost of borrowing. You wouldn't want to be hit from behind on hidden fees down the line. Now that you know the basics on commercial real estate loans, where can you find one? Well, a few different types of lenders offer this kind of financing for small businesses. Commercial banks, credit unions, commercial mortgage-backed security (CMBS) lenders, life insurers, and the Small Business Administration can all help you secure a commercial real estate loan. But as a small business owner, your best bet might be to knock on the SBA's door first. Why You Should Work With the SBA? The SBA offers commercial real estate financing through their CDC/504 Loan Program. A CDC/504 loan is made specifically for purchases of fixed assets. A CDC/504 loan from the SBA is either 10 or 20 years. An SBA loan gives borrowers a fixed rate instead of the prime lending rate. This works out better for the borrower because your interest rate is fixed at an increment above the current 5- and 10-year U.S. Treasury yields. In the end, it'll be much easier for you to calculate the exact amount you need to repay. Almost any owner can apply for a CDC/504 loan as a source of small business funding. To qualify, small business owners will first need to present a feasible business plan and demonstrate some business management expertise. Other noteworthy eligibility requirements are that your business must be worth less than $15 million and have a net income of less than $5 million after taxes. You'll also need to show your projected cash flow data to prove that you'll be able to repay the loan. And finally, you'll have to prove that your business doesn't have the financial capacity to purchase the real estate with your own funds. Gearing up to apply for a commercial real estate loan? You'll need to get your financial ducks in order first. Commercial mortgages tend to have a more rigorous underwriting process than residential loans do. With commercial real estate loans, having a clear and detailed business plan is crucial. Lenders will not only scrutinize your business, but they'll also carefully consider the property you intend to buy and your plans for using it. Make sure you spell all of this out in your business plan. Depending on the size of the commercial loan, you'll also need to prove your business's financial strength. Be prepared to submit 3 to 5 years worth of financial documents, like your asset statements, tax returns, corporate accounting reports, and any other relevant information. You'll also need to show your personal financial information and personal credit history. As with any business loan, make sure you shop around for multiple offers from different lenders. Your commercial real estate loan will be with you for the long haul, so you should be confident that you're getting the best terms and rate for your business. Once you've found a good fit for your business, you're well on your way to getting the real estate you need to bring your business to the next level. This article was originally published on the Fundera Ledger on September 28, 2016.